The text covers Karnaugh Maps (K-Maps), an introduction to the Quine-McCluskey Method, Prime Implicant Determination, the Prime Implicant Chart, and the Incomplete Specific Function Simplification, and combinational logic circuitry. The chapter review and chapter answer sections provide an extensive number of questions with comprehensive insight to showing how to arrive at the answers. 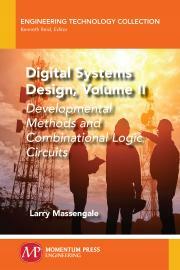 This book will be an extremely valuable asset for technical and engineering students studying digital system design. Larry Massengale has had a broad technical and engineering career encompassing military, defense contractor, and civil servant job positions. His multifaceted career involved positions dealing with maintaining weapon systems, engineering design, research and development, production, logistical support, testing and evaluation, life-cycle management, integration, acquisition, sustainment, modification, software engineering management, and multiple other positions.